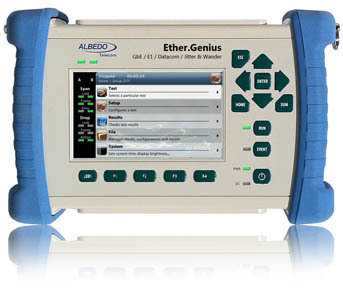 Ether.Genius is a handheld tester 100% suitable for labs or field use because is full equipped (IP/Ethernet/PTP/T1/E1), battery operated (up to 24h of operation), light (1.1kg) and very rugged. 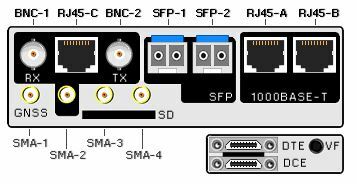 The unit is able to test Ethernet/IP networks up to 1Gb/s while supporting master/slave Sync-E/PTP emulation. It also has interfaces for PDH/T1/E1/E0 and IEEE C37.94. Operation modes includes Performance, Quality and Wander tests at all interfaces and the ability to emulate and analyse PTP/SyncE, while measuring Freq./Phase, PDV metrics, analyse/generate TIE/MTIE/TDEV and TE. A built-in Rubidium clock disciplined with GPS provides an accuracy of a few nsec. You may buy just a last generation dual port 1GbE tester and then you may add other interfaces just when you need it by a simple and easy upgrade by code. Then you will be able to get the new firmware supporting the desired functionalities. Download Ether. Genius Brochure Now ! Download Ether. Genius Datasheet Now ! Download Ether. Genius Presentation Slide Now ! Download Ether. Genius Competitors Advantages Now !